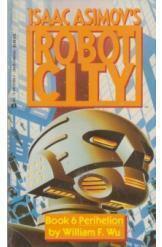 Isaac Asimov's Robot City Book 6 Perihelion William Wu. Book in good condition, all pages intact. In the Robot City series, Assimov challenges contemporary new sic fi talents. In this book, Derec discovers the true secret of his identity. He must confront Dr. Avery and compel him to reveal the truth.